Is there life after death? : Do ghosts really exist? The evidence. Ghosts. Do they come from the land of the dead or the land of living? So do ghosts exist? There have been stories of ghosts and hauntings going right back throughout history. There are countless ghost tales! But do they REALLY exist? Some people will immediately scoff at this question and say of course ghosts do not exist. But I feel it is best to examine the evidence with an open mind. There are certainly plenty of things which happen that people interpret to be paranormal, but don't always turn out to be paranormal. Instead, natural explanations can be found. Whatever explanations we come up with, it's clear that something's going on! I think a better question we can ask is "what are ghosts?". Are ghosts just a figment of our imagination? Are ghosts the spirits of dead people? Or are they something else entirely? Why is this question important? Because it could help to provide an answer to the wider question of whether or not there is an afterlife. What's the evidence? Evidence of ghosts comes in the form of numerous eyewitness accounts, photographic evidence and inexplicable experiences. Ghost stories have abounded for hundreds of years in cultures all across the world. The evidence would appear at first glance to be overwhelming. Can all this evidence be dismissed as hallucinations and camera tricks? SKEPTICAL VIEW: Ghosts are all in the mind? Hallucinations are experiences which seem real, but happen entirely in the mind. They are a subjective phenomena and therefore do not really exist. These experiences are not restricted to people who might be classed as "insane" and can happen to ordinary people. Hallucinations are found to be more common during the times when people are just drifting off to sleep or waking up. This is when we can have a somewhat altered state of consciousness. And this happens to be the time when many people report seeing "ghosts" or other images. Sensory confusion. People have a tendency to see patterns and shapes in things that are not really there. That's why you can play the game of looking at clouds in the sky and seeing certain shapes, which you may point out to a friend who can observe the same thing. This could be what happens in some "ghost sightings"- one person, or a bunch of people, see a pattern or form that isn't really there, it is just the mind playing tricks on them. A dim reflection or shadows and lighting cast in a certain way could be misidentified as something supernatural like a ghost. People who are under the influence of "suggestion" who THINK a place might be haunted can find their minds playing all sorts of tricks on them. Imagination can run wild, and every noise can be interpreted as something paranormal. The grief stricken mind - It is common that when people lose a loved one they will be grief stricken and this grief can bring out all sorts of reactions. If a wife loses her husband who has shared the bed with her for 40 years, she might feel a "presence" for example in the bed, because that is what she usually feels. It is the mind playing tricks. People may have vivid dreams of lost loved ones, again there is nothing necessarily paranormal about this and can just be a natural reaction to the loss of a loved one. So we've heard the skeptical arguments. What about the case for ghosts being real phenomena? In his book entitled "You cannot die" Ian Currie wrote a section called "Are they (ghosts) just hallucinations?" which I think provides an excellent summary of the case in favour of ghosts NOT being hallucinations. I've summarised his main points here into 10 reasons why apparitions (ghosts) are not hallucinations. Normalcy of witnesses- seeing apparitions of the dead does not just happen to people like occultists and spiritualists. The vast majority of people who see apparitions are perfectly normal people. Good health of witnesses- Also, the people who witness apparitions usually report being in good health physically and emotionally. Many do not report anything unusual in their mental functioning (experiencing shock, stress or elation) at the time of the sighting. Most are in a perfectly ordinary state of mind. Suggestion and expectation- many people who witness apparitions find the experience was totally unexpected, and occured within familiar surroundings and "burst in" on them whilst they were going about their normal daily business. High number of reports- according to Currie, there are a very high number of people as a propotion of the general population who claim to have had an experience which convinced them that they were in contact with someone who was dead. Multiple witnesses - hallucinations are purely subjective. It is only the hallucinator who sees and hears them. But according to Currie, there have been many cases where apparitions have been witnessed by more than one individual at the same time, which means they cannot be a hallucination. Successive experiences - apparitions that haunt a certain location may be witnessed by numerous people over the course of many years. You might argue that if you tell someone a story of a haunting , you then place the suggestion in their minds. However, there are many cases where people have no prior knowledge that a location is haunted or what particular incidents tend to happen and have independently reported witnessing/experiencing the exact same ghostly phenomena. Objective phenomena - apparitions can also be accompanied with physical movement of objects, sounds, footsteps ect, all of which are objective phenomena and cannot therefore be a hallucination. Animal reactions to apparitions - animals would not react if apparitions of the dead were purely a hallucination that someone is having. But animals are often reported as reacting to apparitions with fear. Veridical apparitions- these are apparitions which convey information which is later verified as being correct. This information conveyed is information that the witness or witnesses could not possibly have known. Reciprocal apparitions - these are apparitions where a person who is alive undergoes an "out of body experience" and then visits someone that he or she knows. That person then witnesses the disembodied spirit of the living person. It has been reported that apparitions of the dead and apparitions of the living (brought about through 'out of body experiences') have no significant differences. They are virtually the same. Thus, reciprocal apparitions of living people cannot be hallucinations because there are two people in independent locations involved. This strongly suggests that apparitions of the dead cannot be hallucinations either. A further objection- It's certainly possible that some apparaitions are hallucinations. However, one obvious objection that I would like to bring up is to ask why would someone hallucinate seeing the apparition of a dead person who they may not even know anyway? Hallucinations can take on any shape or form, so why would someone simply hallucinate the apparition of a dead person and then stop hallucinating? Why not hallucinate that there is a green eyed monster running around also? Secondly, just because you hallucinate something does not mean that "something" cannot exist. You could hallucinate that a cat is sitting on your bed. It might mean that the cat you see on your bed does not exist, but it does not mean cats do not exist. Similarly, arguing that someone had a hallucination of an apparition means apparitions are false, does not prove this. You would need to argue that ghosts are ALWAYS hallucinations or tricks of the mind, and as we have seen there are objective phenomena which take place to refute this idea. As we have seen, one strong objection to the idea that ghosts are just tricks of the mind is that if they were then the experience should be purely subjective. However, objective occurences are often witnessed alongside the haunting or apparition. So what are some of the skeptical explanations for this phenomena? Fraud and fakers - The first and most obvious skeptic explanation for objective paranormal phenomena is that people are simply lying, motivated by the need for attention, fame, money and so on. There have been numerous cases of trickery amoung those who claim to have contacted the dead or captured evidence of the paranormal. Fakers may find ways to "simulate" a haunting, with noises ect. Those who claim they can contact the dead, people known as Mediums, may simply be decieving people by finding out knowledge before hand about a person or location and then impressing people with accurate details which they claim were given to them "from the spirit world". Also in this catagory would be cases in which people exaggerate certain occurances which in reality were far from fantastic. Natural, mundane explanations- a variety of creepy sounds can occur in the average building as a result of things like temperature changes, the wind, mice in the walls, faulty plumbing ect. Poor insulation and air passages can create cold spots and strange sounds. Residents and people in the surrounding area could also be the source of strange sounds. Also in the darkness, when many ghost sightings are reported, it is easy to mistake mundane everyday objects for something like a ghost. Dust on the lense?- So called "spirit photography" can be explained as double exposures, "orbs" can be explained as the light from the camera flash reflecting off bugs or dust particles in the air. The existance of modern image editing software has now made it easy for almost anyone to create realistic fake ghost photographs. Objections: It is certainly wise not to jump to the "paranormal" conclusion and to check for natural explanations and signs of trickery first. What about cases where natural causes cannot be found?- Whilst some paranormal activity can be down to natural causes, there are cases where natural explanations cannot be found. Closed minded skeptics will not see this as a sign of the paranormal, but simply that we have yet to discover a non-paranomal cause for a particular occurence. Closed minded skeptics may simply ignore and dismiss paranormal evidence that they cannot explain away or falsely attribute natural causes. Many people want to rid their homes of ghosts. Far from being motivated by the prospect of money, there are many people who are willing to PAY people who claim they will be able to exorcise ghosts from their homes. They do not want fame or attention, they want the paranormal activity to stop. Hoaxes do not disprove the afterlife. You can fake just about anything. You can create any kind of elaborate hoax. You can fake being ill for the purposes of gaining attention or money, but that does not mean that illness does not exist. Similarly, just because there are people who have faked paranormal phenomena, does not mean that real paranormal phenomena does not exist. Of course you could use software these days to re-create every ghost photograph that was ever taken, but does this mean they are all fakes? Communicating with fictitious (made up) Ghosts? In the early 1970's, a group known as the Toronto Society for Psychical research created a fictitious ghost by the name of "Philip" to see if they would be able to "make contact" with this entirely made up entity. They created a detailed history for "Philip" and the details of how this fictional charactar was supposed to of lived his life and died. This became known as "the Philip experiment". The group would sit in a room and meditate together focussing on the fictional charactar, and see if they could make any kind of contact. For a whole year, this method failed to produce any results. Then the group decided to try a spiritualist style seance to contact Philip. They sat around a table, dimmed lights and focussed on the fictional charactar. They then recieved "communication" in the form of a rap on the table. Then they started to ask the entity questions, one rap for yes, two for no. The entity identified itself as Philip. Further paranormal phenomena resulted, with the table levitating, moving and sliding and even moving toward certain group members and trapping them in a corner of the room. "Philip" would also apparently be able to dim and restore the lights upon request. "He" was able to cause the group to feel a cold breeze blow over them at will. On some occasions , a fine "mist" was reported hovering over the table. Many more of these experiments have been carried out where people will create fictional ghosts and contact them usually through rapping noises, with the ghost appearing to show signs of having its own "personality". What are we to make of these experiments? Does this mean that ghosts do not exist? It proves that Ghosts do not exist. This theory does not explain how the paranormal OBJECTIVE phenomena occured. The experiment was not conducted to disprove the existence of ghosts, nor does it. Paranormal activity is somehow created by our unconscious minds. This explanation makes sense, because "Philip" never communicated anything which the subjects involved didn't already know. He was "limited" by their knowledge. The objective phenomena may of been caused by what is termed "psychokinesis"- which is found in some poltergiest cases. This is where the living person is said to be generating objective phenomena with their mind or "mind over matter". They created a "thought-form". In other words, they actually used their collective energy to genuinely create a new entity. More info. They contacted a playful ghost. Perhaps a ghost really was present and just acted the part of Philip to make contact? Perhaps ALL the fake ghosts that have been contacted are just playful spirits? Is this really feasible? Ghosts of the living or ghosts of the dead? This is the ultimate question- are ghosts just a projection arising from the minds of living people, or are they really the ghosts of dead people? Research into cases of poltergeist activity in the past has lead some to conclude that it was somehow the persons own mind that was creating the bizzare phenomena. Not everyone agrees with this theory. The other argument is that anyone who dabbles in using ouija boards or seances or spiritism generally without being fully aware or protected or prepared can attract negative "lower vibrational" entities which will often pretend to be a deceased loved one or assume any kind of false identity to be able to be around people. Sometimes they will give away information about the future or impress people with other kinds of information. These are entities which are ultimately looking for a body to possess, and will use deciet and trickery to draw people close to them. Perhaps in many of these cases where "fake" ghosts have been attracted, it is a lower vibrational entity that is feeding off the information in peoples minds just to draw closer to them. 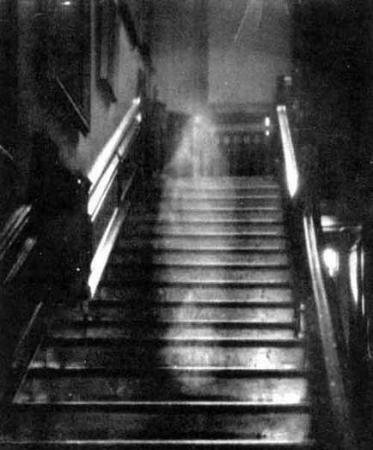 Another possibility is that both kinds of hauntings are possible- hauntings by the living and hauntings by the dead. If we essentially are going to become ghosts ourselves when we die, it stands to reason that we would have some of the "powers" that ghosts have right now, but in a much more limited scope. Any concluding thoughts on this matter? What can be said is that I have yet to come across any evidence from the experiments done into psychokinesis and telekinesis (the ability of mind to influence matter) that these abilities can do things such as materialize apparitions, create voices or other similar phenomenon. Successive experiences as mentioned before, where completely independent visitors to a haunted location witness the same paranormal phenomena is one possible argument that could be used against the idea that all ghosts are products of the mind. What about popular TV shows like 'Most Haunted'? I think whether you are a total skeptic or a believer in ghosts you will see that what shows like Most Haunted do is paint a fairly sensationalist view of investigating ghosts. Viewers want to be scared and entertained right away. However, real paranormal investigation doesn't usually work this way. So what Most Haunted relies upon to provide the entertainment that viewers crave is the dramatics of the people on camera. The Cameras are on the crew filming their "reactions" at least 90% of the time. We see night vision cameras and a bunch of people getting freaked out in an alleged haunted location, and it's entertaining to watch for a while (other people might just say predictable, and boring!). They will scream everytime they hear a knock or bump. The fact is if you sit quietly in ANY building there is a natural level of noise and this cannot automatically be taken as paranormal activity. So it doesn't really amount to a serious investigation. I say this because the crew will visit a location and maybe stay a night. Real investigations go on for months and months. Religious explanations- Are ghosts demonic? You would imagine that religion generally would be not only acceptive, but promoting the paranormal as being real. But suprisingly this isn't often the case, despite their beliefs in heaven, hell, the devil, and god, some will rubbish the idea of ghosts and hauntings altogether. Other religious thinkers would say that paranormal activity is certainly "real" in the sense that the phenomena that takes place is being caused by a supernatural entity, but deny that these entities are disembodied spirits of the departed. Instead, they interpret these entities as demons or demonic activity. These demons would impersonate dead loved ones and use spiritism to trick and decieve, to possess and lead people away from God. An example of a modern religious group that believes this are the Jehovah Witnesses and some other Christian groups. They base their authority for this belief upon their interpretation of what the Bible says. However, there has been a long history amoung orthodox religion of actually persecuting those who practice spiritism. Is the Bible (or any said religious text) the authentic word of God? How can this be proven? I think there is a logical case to be made against the "all ghosts are demons in disguise" idea also. Why would demons do this? The argument given is that demons seek to ultimately lead people away from God? Well what about all these people who have encounters with apparitions and after death communications which give them comfort and hope? What about all the people who may have been atheists who actually became devout believers in god after a supernatural experience? What about all of the experiences where people felt a loving energy? I think some organised religions are equally opposed to aspects of the paranormal, because it threatens some of their beliefs. The "ghosts are the devil coming to destroy your soul" idea seems to me to be an idea designed to strike immense fear into people in order to protect traditional beliefs more than anything else.